The men are said to be part of the hit squad that ambushed Khashoggi in Turkey. The 17 individuals, the U.S. said, are the 15-man hit squad that traveled to Turkey to carry out the operation, the Saudi consul general in Istanbul, Turkey, where the killing took place, and a senior adviser to Crown Prince Mohammed bin Salman. It's the same list of people that the Saudis themselves have blamed and arrested for the killing, which the Saudi government at first denied, then called an accident, before labeling it a rogue operation. The 17 were also among the 21 Saudi officials that the U.S. already revoked or banned U.S. visas for. (Leah Millis/Pool via AP) Secretary of State Mike Pompeo shakes hands with the Saudi Crown Prince Mohammed bin Salman in Riyadh, Saudi Arabia, Oct. 16, 2018. 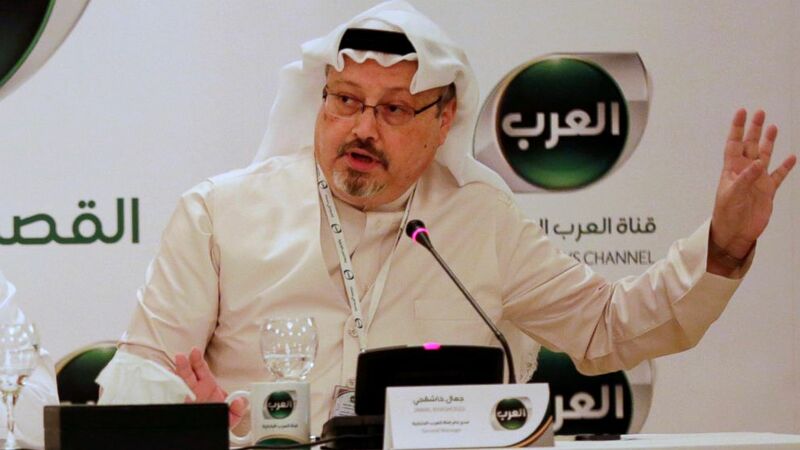 The Saudis have maintained that it was this small group of officials who are solely responsible for Khashoggi's murder, admitting Thursday that the killers drugged and killed the writer and critic of Crown Prince Mohammed bin Salman inside the consulate, before dismembering his body and handing it over for disposal by an unidentified local collaborator. The body still has not been found. With the sanctions, the U.S. freezes all assets for the men and blocks any U.S. persons from doing business with them. While that's unlikely to make much of a difference with the group all imprisoned in Saudi Arabia, the sanctions do send a message that the U.S. takes the issue seriously. That group includes the deputy intelligence chief Ahmed al-Asiri, who has been blamed by the Saudis for authorizing the operation. The Saudi prosecutor's spokesman and deputy attorney-general Sheikh Shalan al-Shalan said Thursday one unnamed individual was responsible, but did not name Asiri. 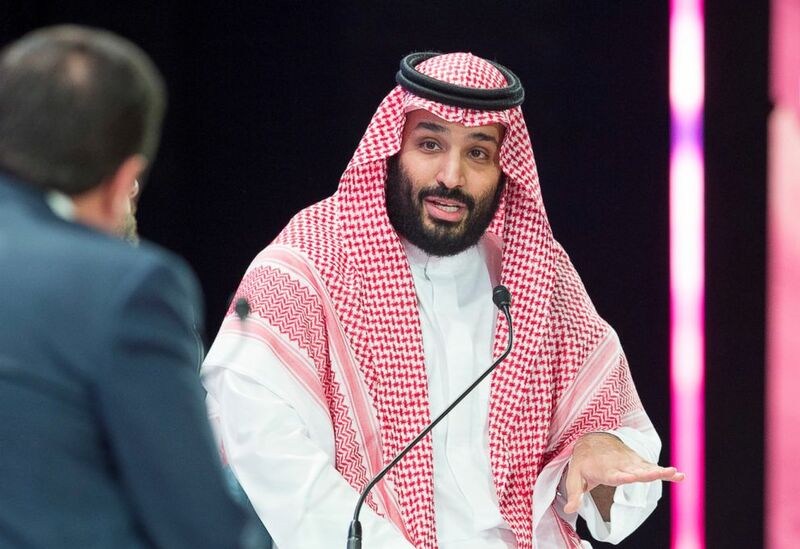 Still, it's clear the Saudis are working to separate the Crown Prince, the strong-willed young leader who is the real power behind his father King Salman's throne, and instead blame a smaller chain of command. "The United States continues to diligently work to ascertain all of the facts and will hold accountable each of those we find responsible in order to achieve justice for Khashoggi's fiancée, children, and the family he leaves behind," Treasury Secretary Steven Mnuchin said in a statement. 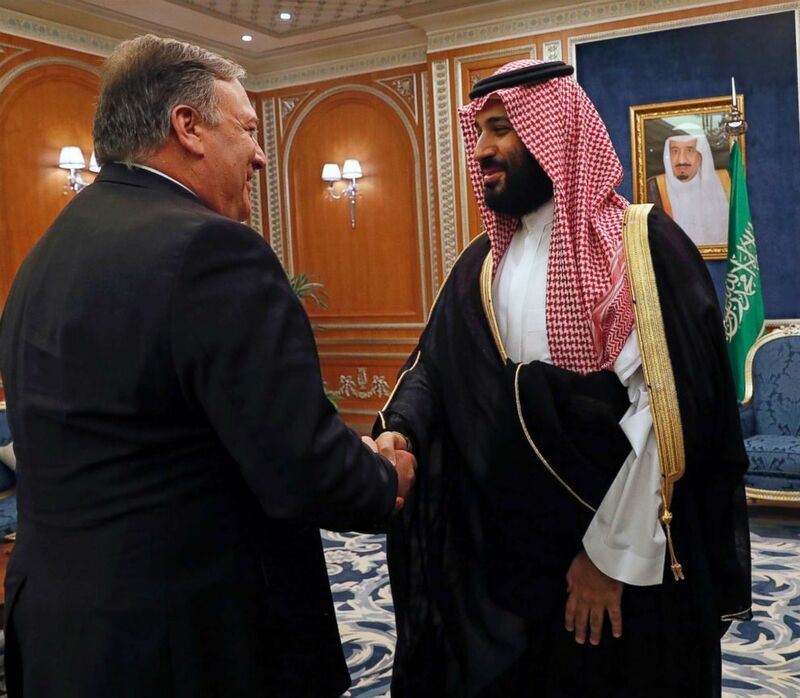 Secretary of State Mike Pompeo also said Thursday that his agency "will continue to seek all relevant facts, consult Congress, and work with other nations to hold accountable those involved in the killing of Jamal Khashoggi." But National Security Adviser John Bolton said on Tuesday that recordings of the killings do not implicate Prince Mohammed, sometimes known by his initials MBS. "I have not listened to the tape myself, but in the assessment of those who have listened to it, it does not, in any way, link the crown prince to the killing," Bolton said. Saudi Foreign Minister Adel al-Jubeir said much the same Thursday, telling reporters during a press conference, "Absolutely, his royal highness the crown prince has nothing to do with this issue." Mnuchin added a rare rebuke from the Trump administration for the Saudis' human rights record in his statement, too: "The Government of Saudi Arabia must take appropriate steps to end any targeting of political dissidents or journalists."